This post is a sticky, so will permanently stay at the top of my blog …..
UPDATE more incredible than before : I haven’t had a chance to do a real update post yet, but I wanted to make sure that those reading this post realise that there has been one, and all the improvements are INCREDIBLE. 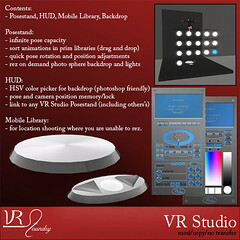 – Up to 250 libraries in one posestand. – 2 formats for displaying library spheres from the posestand. – Add or remove poses to a library at any time by changing the library prim inventory. – Delete a library by unlinking it from the posestand and deleting the prim. 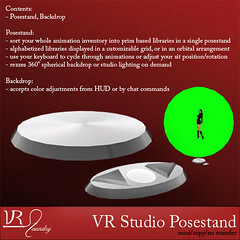 – sphere and lights rez in correct place when posestand is tilted. – fixed issue causing spere to fail to initialize under some circumstances when region hadn’t been restarted recently. – Version 3.0 checks for updates automatically from anywhere on the grid, so you’ll get any updates immediately! – Future stand updates will include an updater tool for the scripts in your existing stand making updates painless. Some people have run into the issue that they accidentally put a no copy animation into a posestand which had thousands of animations in it, thus making the entire posestand no copy. Trying to scroll through thousands of animations to find the one or two that are no copy takes an eternity and is usualy fruitless. I’m including a script which you can drop into a library that will check the permissions of all its animations. When it finds a no copy animation, you can either have it give the animation back to you, delete it, or ignore it. 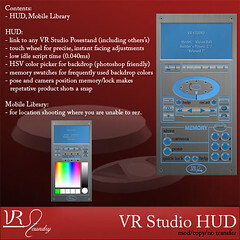 Isn’t that AWESOME, and if you have a previous one you can update by going to either the VR Foundry Main Store or VR Foundry @ The Deck wear your stand and or hud and a new one will be sent to you , easy .